Star Wars The Force Awakens Plush Throw & Darth Vader Just $18.10 Down From $50! You are here: Home / Great Deals / Amazon Deals / Star Wars The Force Awakens Plush Throw & Darth Vader Just $18.10 Down From $50! Head over to Amazon and score this great deal on Star Wars The Force Awakens Plush Throw & Darth Vader for just $18.10 down from $50! Get yours now while it lasts! Star Wars Episode VII Darth Vader Hugger measures 12” x 9” x 11” The Polyester fill fiber makes it a great pillow or just a friend to cuddle. Warm, Soft Polyester Throw measures a generous 40” x 50” A perfect size to keep the chill away. 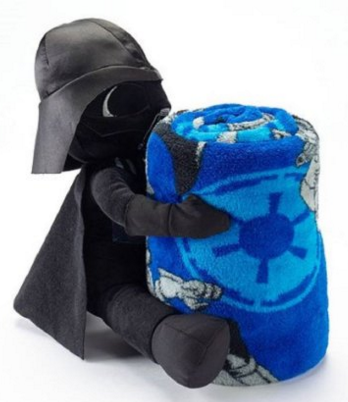 Easy maintenance spot clean hugger Darth Vader and machine wash throw 2 piece set. Detailed durable stitching in black, gray and blue and Star Wars print throughout. Makes a great fun and collectable gift for the die hard Star Wars fan on your list. Kids and Adults alike will love it.